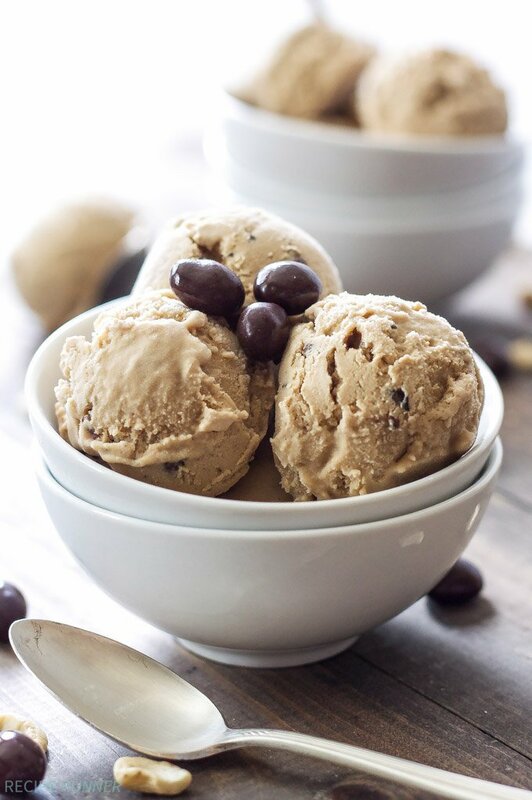 This Coffee Cashew Ice Cream is ultra thick and creamy thanks to the raw cashews and vanilla cashewmilk! You’ll never suspect it’s dairy-free and vegan! Here it is the middle of July and I bet many of you are in the heat of summer. I can’t complain about the heat too much here in Colorado. We’ve had a couple “hot” days where it’s been around 95 degrees, but that’s nothing compared to my days growing up in Arizona. It’s about this time of year that not only are most days 105-110 degrees, but the humidity goes up and even at night it’s miserable! So when I say I can’t complain about 95 degrees here, I really mean it, I know what hot is! My favorite way to cool down on a hot day is with a scoop of ice cream. Growing up in a hot climate I pretty much wanted ice cream every day! This may explain why ice cream is my favorite dessert. A few summers ago I finally got my own ice cream maker and I have to say it’s one of my favorite kitchen gadgets. I of course love making traditional ice cream with cream and eggs, but this time I decided to give vegan ice cream a try. Recently Silk came out with both vanilla and chocolate cashewmilk, if you haven’t tried them yet go here and sign up so you can get a coupon and try them out. Being both a vanilla and cashew lover I knew I had to give the vanilla version a try. Now don’t get me wrong, I enjoy chocolate every now and then, but I have always been a vanilla lover at heart. The cashewmilk was so creamy and had a rich vanilla flavor, I knew it would be the perfect dairy free substitute in the cashew ice cream. While I could have just stuck to vanilla cashew ice cream, I opted to add in a cup of coffee and some instant espresso powder because 1) I am a coffee addict and I say that with no shame 2) my husband is a sucker for coffee ice cream and 3) vanilla is a great flavor enhancer to coffee. 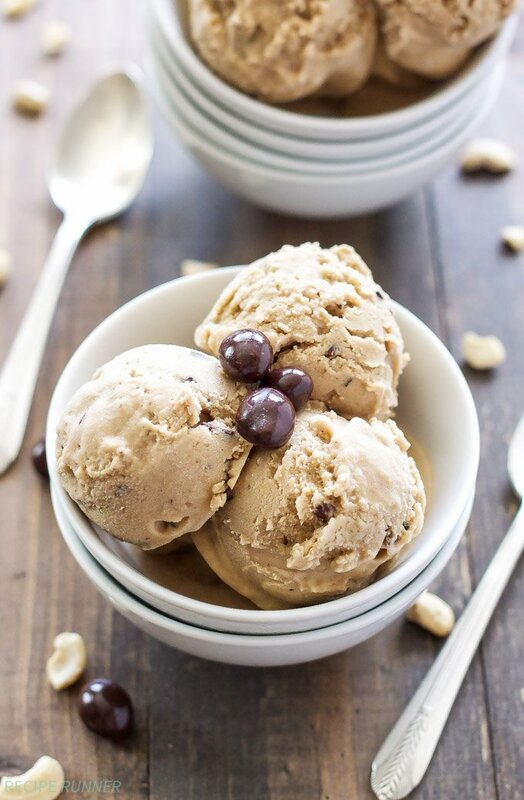 Not only does this coffee cashew ice cream use the creamy Silk Vanilla Cashewmilk, but it also uses raw cashews. The cashews are soaked in water overnight so they become soft. Once they were soft I added them to my high speed blender along with the vanilla cashewmilk and pureed the mixture until it was smooth and thick. To the cashew cream I added a cup of brewed coffee, sugar, espresso powder, and vanilla bean paste, then blended it again until it was completely combined and smooth. The ice cream base chilled in the fridge for a couple hours then I put it in my ice cream maker and churned it until I had some of the creamiest ice cream I had ever eaten! For a little extra coffee flavor I mixed in a few chocolate covered espresso beans, but it’s totally optional. 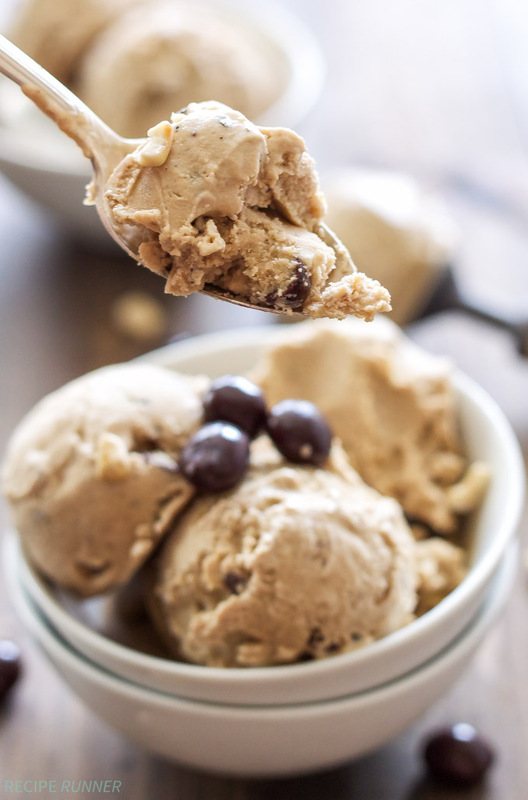 If you’re like me and need a cold sweet pick me up on a hot summer day, then you have to give this dairy-free, vegan, Coffee Cashew Ice Cream using creamy Silk Vanilla Cashewmilk a try! I bet you won’t even suspect that it was made with cashews! Place the bowl of the ice cream maker in the freezer and let it freeze overnight. Place the cashews in a bowl and cover them with water. Let the cashews soak for at least 4 hours or overnight. Drain the soaked cashews and add them to a high speed blender along with the vanilla cashewmilk. Blend the mixture until it is thick and smooth. Add all of the remaining ingredients to the blender except the chocolate covered espresso beans and blend until smooth. Refrigerate the ice cream base until it is cold, about 1-2 hours. Pour the ice cream base into the prepared ice cream maker and follow the manufacturers instructions. During the last minute of churning add in the chopped up chocolate covered espresso beans. 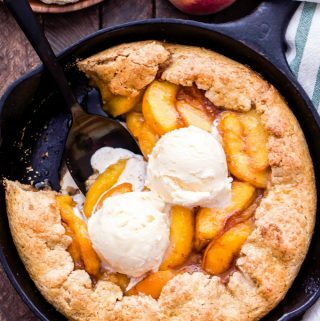 Once the ice cream has finished churning, pour it into a loaf pan or other freezer safe container, cover, and freeze until hard. The ice cream will freeze hard so allow 10-15 minutes for it to sit out before serving. 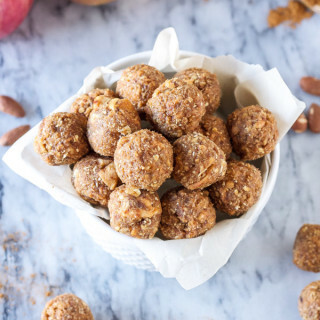 I have SERIOUSLY been wanting to try that cashew milk because I am obsessing over ALL things cashews lately! I would much rather have a big bowl of this frosty goodness instead of the coffee I'm drinking ;) Pinned! Yum! I love coffee flavored ice cream, will try making it with cashew milk next time! Is it too early for ice cream? This looks AMAZING! It's never too early for ice cream Lexi! Thanks girl! I have yet to try cashew milk. . but I can't wait to get my hands on some!!!! I LOVE this ice cream!!! looks fabulous! Thanks Alice! Cashew milk is one of my new favorites, it's so creamy and good for so many things, especially ice cream! Thanks Carrie! You have to try out the cashew milk, I know you'll love it! I've been meaning to make coffee ice cream for the longest time, since it's one of my faves and seeing this post has definitely lit a fire under my booty! I also haven't tried making ice cream using soaked cashews and I'm dying to! Bravo! Bravo all around, sister! Thanks Julia! 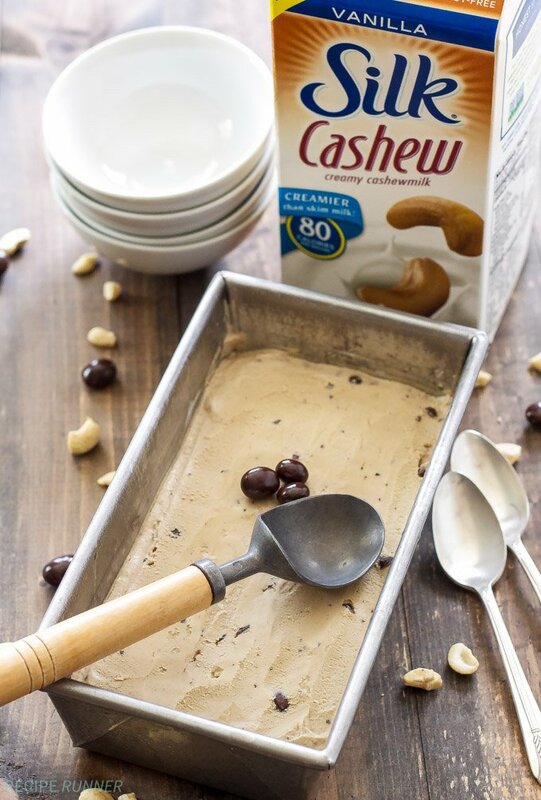 You have to try soaking the cashews, you won't believe what a great creamy texture they give the ice cream! Oooooh coffee ice cream WHOA!! My kind of gal you are. Also chocolate covered espresso beans by no mean can be optional, because those little suckers are so good. Thanks Meg! Chocolate covered espresso beans are never optional for me, I absolutely love them! I could totally go for a giant scoop of this right now! I'm craving a sweet treat like whoa and ice cream is high on my life. I need to give this cashew milk a try stat! Ice cream is always high on list of things I need to eat! You've gotta give the cashew milk a try, so so creamy! This is sooo good. I didn't find vanilla cashew milk from Silk near me, so I used the regular sweet kind, a cup of iced toddy from the local coffee shop, a mix of vanilla extract (running low!) and a vanilla bean. I didn't have instant coffee, so I used some regular coffee that was ground very fine. Anyhow, this is so good and creamy. I just put it in the freezer after putting it through our ice cream maker. I look forward to having it tomorrow! Thank you! The hardest part about making this ice cream is waiting for it to freeze, I'm pretty sure I ate half of it right out of the ice cream maker! Thank you for trying the recipe Cindy and I hope you enjoy it today! 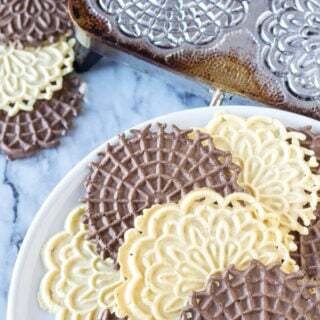 Going to make this today. I couldn’t find vanilla cashew milk. How much vanilla extract would you recommend using?? Hi Deb, I would add an extra 1/2 teaspoon of vanilla extract on top of what the recipe already calls for.